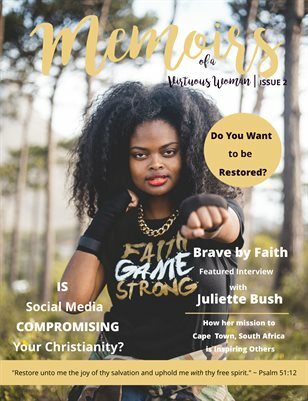 We present to you another timeless, full color magazine just for you that continues the mission of believing all women to follow the narrow path in Christ. Featured pieces include: Do You Want to be Restored? Weighed down by the stresses of life? This article is for you! Encouraging you to dive deep in God's word for renewal everyday. - Brave by Faith Juliette Bush shares how her mission to Cape Town, South Africa is inspiring others. - Is Social Media Compromising Your Christianity? Social Media - It's practically taking over our generation. How much is too much? God's word comes first but it seems many have gone astray with the constant attraction to social media. When you are online, what are you posting? Are you setting an example of a true woman of God or the complete opposite?